Accepting possible opportunity cost now may be better than risking large loss to pursue gain. The S&P 500 continues to look very weak, even though it has recovered from its worst levels in the last several days. 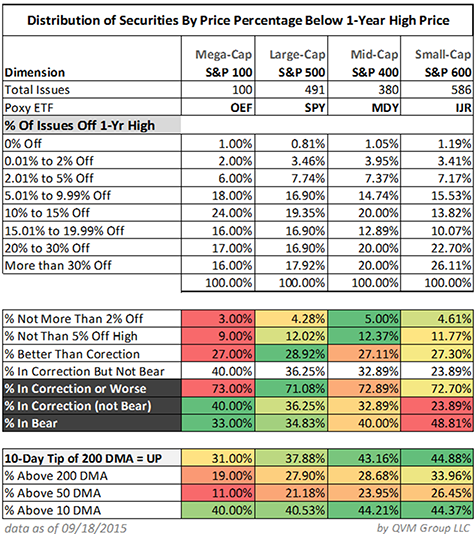 We continue to hold large cash positions (and have done so for a few months now) either for retiree or near retiree accounts that cannot tolerate a potentially large draw down, or for accounts that prefer to make tactical allocation changes between cash and stocks in the face of infrequent but potentially large price declines in the S&P 500. We sincerely hope we are in no more than a correction, but believe by virtue of rational indicators that more may be brewing. We would rather be safe than sorry, and are prepared to incur certain opportunity cost in lieu of capital loss by holding significant cash positions – which we expect to reinvest when the same indicators suggest the dark skies have cleared. The last two images in this letter update the summary tables for that discussion. We have annotated the chart with large semi-transparent red and green dots to show how the indicators identified key major trend changes over the last 20 years. When the bold red line in Panel #5 is at the zero level, the major market trend is expected to be DOWN. 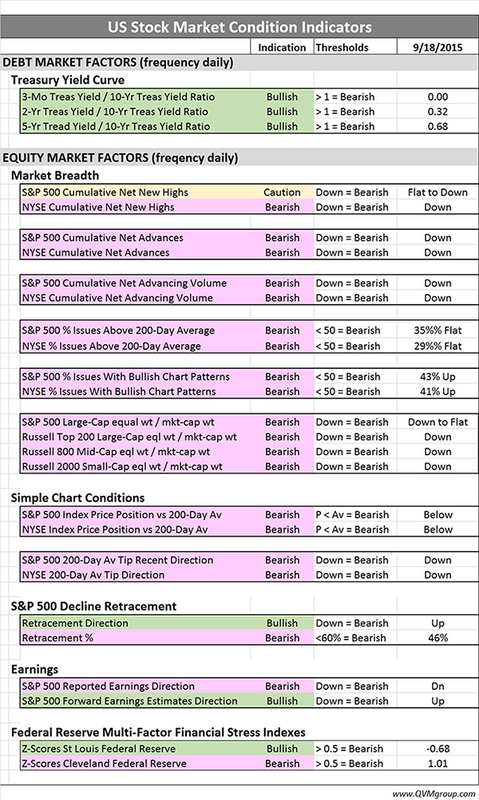 When the bold red line in Panel #5 is at 100, the major market trend is expected to be UP. Here are the same binary indicators applied to monthly, weekly and daily data presented side-by-side. Do note that the frequency of whipsaws (false or highly transient indications) for weekly and daily periods are high. The method is best suited for monthly periods, but perhaps the weekly and daily data is useful to see how the current month is developing before it ends and can be added to the monthly chart. The weekly data is solidly negative, but the daily data is trending to positive, consistent with the recent relief rally in the S&P 500. We are in 50% or higher cash positions in accounts that do not have the capacity to withstand up to 3 years of negative stock returns. We are not predicting three years of negative returns, but for actively retired or near retirement clients, the deleterious impact of fixed amount withdrawals on a volatile portfolio in a negative return period can be severe – the “Risk of Ruin” (outliving your assets). Conservation takes precedence over growth in those situations. Investment funds directly referenced or based on named indexes in this article: SPY (S&P 500), IVV (S&P 500), VOO (S&P 500), VFINX (S&P 500), OEF (S&P 100), MDY (S&P 400), IVOO (S&P 400), IJR (S&P 600), VIOO (S&P 600). More importantly, since the S&P 500 covers more than 80% of the US stocks market-cap, and with the S&P 400 and S&P 600 cover nearly all of the market-cap; this article is about the US stock market as a whole, and virtually all of the broad-based ETFs or mutual funds available. 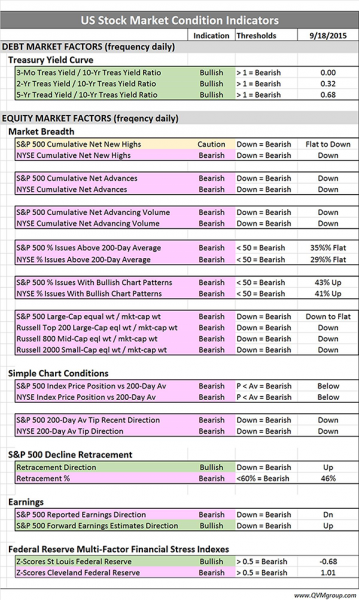 This entry was posted on Tuesday, September 22nd, 2015 at 11:47 AM and is filed under Analysis, market outlook. You can follow any responses to this entry through the RSS 2.0 feed. Both comments and pings are currently closed.